On Christmas Eve in 1944, Bob Wallace (Crosby) with the help of Phil Davis (Kaye) put on a small Christmas show to entertain their Army company and pay tribute to Major General Waverly (Jagger), who is leaving the outfit. The company is then attacked and Davis saves Wallace from a falling wall. When Wallace comes to thank Davis, Davis convinces him to go into show business with him. Fast forward 10 years and Wallace and Davis are both successful performers and producers. On their way to New York after a performance in Florida, they stop to catch the act of Betty and Judy Haynes, sisters of an old Army buddy. After a series of events, Wallace and Davis end up heading to Vermont, rather than New York, with the sisters to an inn where they are performing. The inn is owned by General Waverly, who isn’t doing very good business. The two men set out to help him boost business. 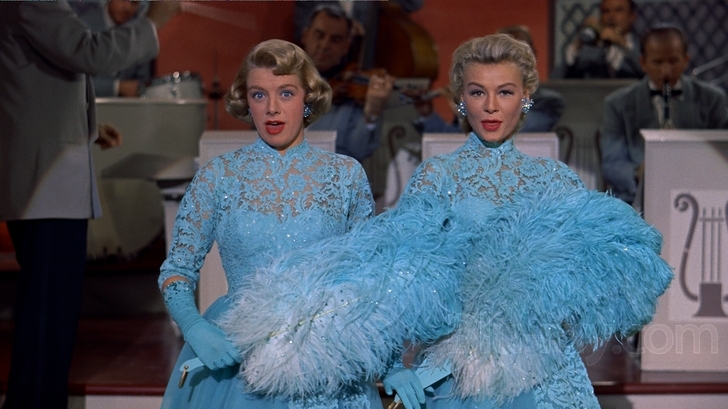 Rosemary Clooney and Vera-Ellen in “Sisters.” Clooney sang both parts of the song. -Ginger Rogers and Debbie Reynolds were considered as female leads for the film, according to “Late Life Jazz: The Life and Career of Rosemary Clooney” by Ken Crossland, Malcolm Macfarlane. -The first Paramount Picture to be filmed in VistaVision, a higher resolution, widescreen, 35mm motion picture film format created by engineers at Paramount. -Rosemary Clooney said in an interview in 2000 that she loved making the film. She also said she was not a dancer and Vera-Ellen- an extremely versatile dancer- was very patient with her. -The photo of Betty and Judy’s brother is actor Carl Switzer, who played Alfalfa in the “Our Gang” films. -Top earning films of 1954. -The “Abraham” dance number with Vera-Ellen and John Brascia. -Barrie Chase meeting Bing Crosby at the beginning and saying “Mutual I’m sure” her “Kiss my foot, or have an apple” line. Chase may be my favorite character in the film. -Every musical number in the whole film. Maybe I’m not a very good film fan, because there are few films I can say I have seen more than 10, or even 5 times. There are so many to see that I just keep pushing through. 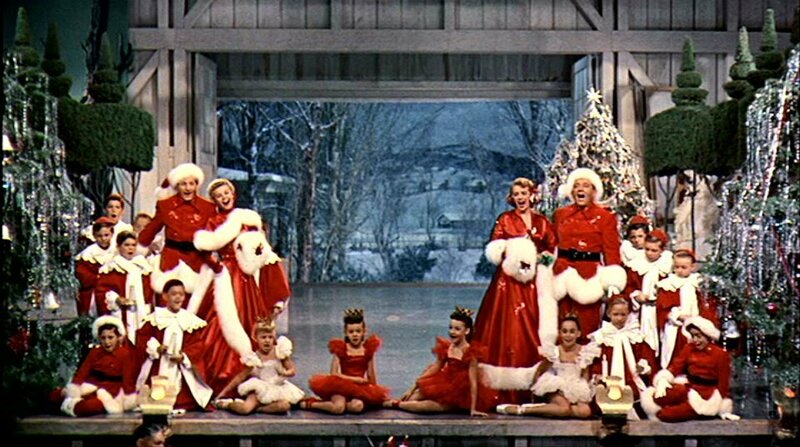 But “White Christmas” is one of those rare films that I can quote along or know the what dance step is coming up in a musical number. I credit this film for my desire to dance and driving me to take tap dancing lessons- particularly the “Abraham” and “Mandy” numbers. It is a film that my family has watched nearly every Christmas for as long as I can remember and is easily a favorite films. I could talk forever about how well the cast, costumes and musical numbers fit beautifully together to weave an interesting story that leaves you tearing up at the end. But I recently had an opportunity to see the film with fresh eyes. On Sunday, Dec. 14, my family went and saw it on the big screen for the first time. A film that I have seen over 30 times and thought I knew backwards, I suddenly noticed things I had never seen before. I never noticed that Bing Crosby had yellow socks when he drives up to bring the mail to General Waverly. Or I never noticed some continuity errors, like when we are introduced to the Haynes sisters, Judy sets down the coffee pot and in the next shot she is holding it. But most of all, I noticed the nuances in performances, especially Danny Kaye’s comedic genius. You can see a film for years, but there is something special about watching it the way it was supposed to be shown that gives you an even greater appreciation. 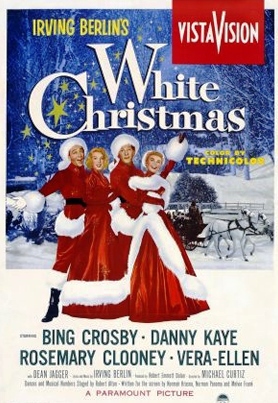 This entry was posted in Musical Monday and tagged classic Christmas films, Musical Monday, White Christmas by Jnpickens. Bookmark the permalink. so glad you got to see this in the theatre…. thank god, Fathom and TCM realize that there is a tremendous difference seeing these gems on the big screen. i have an optimistic feeling, that there will be more and more of these screenings, with the success of Casablanca, a couple of years ago… and the festival (you lucky dog…) in LA , seems to be growing all the time! this year alone– TWOO and GWTW anniversary showings…. all this adds up to good times for all of us fans in the coming years ! great review, Jessica!